My connection to the history of ED559 comes via my father, Alan. Among his small collection of photographs from his wartime service in the Royal Navy was the portrait of Richard Curle. All I originally had were my father's memories and this picture. My father lived closed to Richard in Glynwood Gardens in the Sheriff Hill area of Gateshead. Though ten years older than my father, Richard formed a close relationship with him. My father recalls Richard as an absolutely top bloke and someone he clearly looked up to. He worked as an engineer and had a lovely small Riley motor car. Upon learning of Richard's death in 1943, my father (who was in a reserved occupation making steam winches at the time) immediately sought revenge and went off to the recruiting office to join the RAF. Alas, slightly less than perfect eyesight saw his air gunner hopes dashed. However, he popped into the Royal Navy recruitment office and they took him on. After signalman training at HMS Royal Arthur (it sounds magnificent but was actually the Butlins camp at Skegness), my father saw active service on Atlantic convoys (on the decrepit WWI-era HMS Vesper), coastal forces and at Gold Beach on D-Day (ML 303), on a Flower Class corvette in the Med and Adriatic (HMS Vetch) and then a long stint on Gibraltar until demobbed in October 1946. Over the years I've looked into the loss of ED559 and found snippets of information on websites and forums. I've been both amazed and humbled by the support and generosity of people with their time and information over the years. I've asked all sorts of questions and people have been kind enough to supply answers or direct me in the right direction to view the original official documents. I would like to say a special thank you to the nephew of Harry Riding who copied Harry's log book and other documents. As each piece of information comes to light it adds a little more to the story. The family of the pilot Richard Curle have also been very generous with photos and documents regarding the Curle family. Also, Greg Harrison, the historian of the 100 Squadron Association who answered many, many questions over email. The final outcome of ED559 remains a mystery though; it's highly unlikely we'll ever learn why their Lancaster came down in the sea that night. What is known for sure it that seven young men died and families in Britain and Australia spent the next few decades wondering what happened to their loved ones. Their names appear on many memorials both in Britain and Australia but more likely than not, most people don't readily read those names or consider the sacrifice made by each person as they pass by. The site hopefully provides a lasting tribute to just one bomber crew lost during the Second World War and elevates that loss from the footnotes of RAF history. 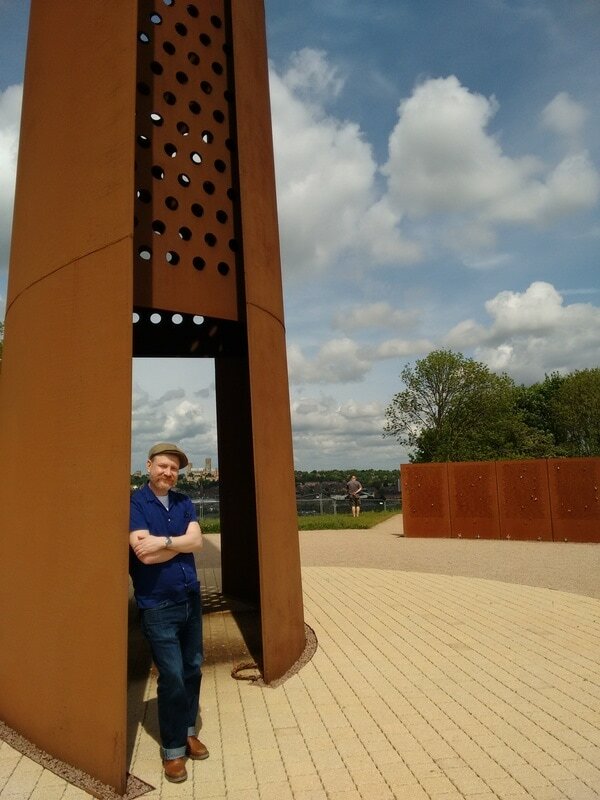 Author beneath the memorial spire at the International Bomber Command Centre, May 2017.